Sherry Turkle has 1 media appearance. Read and discuss a variety of books exploring how to create a more civil and engaged community.Join Mary Dumas on the third Wednesday of the month from noon to 1:30. Authors DO NOT attend. Meetings are in the Readings Gallery -- brown bag lunches are encouraged. Anyone interested in exploring their role as an engaged citizen is welcome. With the season of gadget giving nearly upon us, this book refreshes our thinking about what tools we use and the systems they value. While the author has nothing against social media, NY Times book reviewer Join us for a conversation that explores the value of robotics for human improvement and those pesky secondary features we may be just a bit too accepting of. Sherry Turkle is currently considered a "single author." If one or more works are by a distinct, homonymous authors, go ahead and split the author. 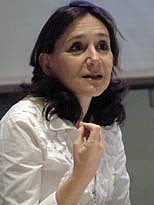 Sherry Turkle is composed of 5 names. You can examine and separate out names.